Nearly a century after the United States rejected the League of Nations, debates over U.S. national sovereignty have never been more heated. Unfortunately, contemporary debates over how to defend and exercise that sovereignty are confused. In his book, Patrick examines how to protect sovereignty while advancing American interests in the global age. HAASS: Well, welcome to the Council on Foreign Relations. And tonight we are here to hear a conversation with the gentleman to my left, Stewart Patrick, or S.P., as he is known. “The Sovereignty Wars: Reconciling America with the World.” Just published—what was the publication date? To be published? PATRICK: Actually Halloween. October 31st. HAASS: Yes. And in the triumph in hope over experience, he has now ended up at the Council on Foreign Relations. PATRICK: Great to be here. So “The Sovereignty Wars.” Who’s at war with whom? PATRICK: “The Sovereignty Wars” is titled because it describes a huge collision between the United States—two collisions. One is the United States and the world that it made, and its actual attitude frequently towards those very same institutions. So you have, in a sense, the United States now questioning the infrastructure, the institutions of post-war order that it built. But also, domestically, it’s really about the clash between those who have an outward-looking, outward-facing view about what the United States’ role in the world should be, and those who have more of an issue—more of an idea that we should hunker down, that we shouldn’t be encumbered. And in a way, it’s getting back to previous debates after 75 years of U.S. globalism. HAASS: OK, so let’s walk it back a bit. What’s your—because everybody seems to have their own definition—what’s the Stewart Patrick definition of sovereignty? PATRICK: A sovereign state is a country that is independent, that has significant freedom of action, and is able to control its own destiny. The problem is that all three of those things do not always go together at the same time. And so the thesis of my book is that to actually fulfill the nation’s destiny and accomplish things that it wants to in the world, it often has trade off—what I call sovereignty bargains—it has to trade off some notional freedom of action for effective international cooperation. Most of that stuff is about the authority of the Constitution of the United States. And the argument that I make is that you have to stop thinking about the United States somehow giving up its sovereignty if it joins international organizations and signs up to international treaties. Those are embodiments and expressions of American sovereignty. They are not surrenders of American sovereignty. But the point I also make in the book is that we really need to recognize that there are certain tradeoffs we have to make in an age of globalization. Part of that is being less free agents than we sometimes want to be. HAASS: For example, so, like, you talk about sovereignty bargains. You just used the phrase “tradeoffs.” Give us an example or two. As opposed to unlimited or perfect or whatever you want to call it sovereignty, give me—give us an example of a bargain or two? PATRICK: OK, yeah, a couple bargains here. One of them is the chemical weapons convention, right, which we agreed to signed and ratified, I believe, in 1997. And that basically makes us—it takes away some of our flexibility. It basically says, look, we foreswear an entire category of weapons—some of the more heinous weapons that have ever been developed. And the reason we do that is because we’ve decided we’re not going to use them. And we also want to have—there were some reciprocal obligations on the parts of others. In an age in which technology is proliferating and there are lots of dangers out there, we have basically foresworn a certain potential degree of conduct. HAASS: I’m going to interrupt because this is what I don’t get, so help me understand. HAASS: Something like the chemical weapons convention, no one put a gun to our head and said: You have to sign this. HAASS: So it was a sovereign decision. PATRICK: It’s a sovereign decision, absolutely. HAASS: To give up—we thought, essentially, the tradeoff was fine. We’ll give up the sovereign option, I guess you’d call it, to develop chemical weapons in exchange for others giving up theirs. HAASS: So that seems to me not all that controversial. When I think of people who have real problems with sovereignty, they think of some type of animal out there, or organism out there, or whatever you want to call it—organization out there that rather than us forfeiting voluntarily some of our sovereignty, this organization would take it away from us. And that’s what I—when I sense the pushback, the reason this is such a hot topic—tell me I’m wrong—that seems to be it. PATRICK: Yeah. Yeah. And that’s the thing. I mean, there are—you know, when a lot of the—there’s a bunch of folks out there who describe themselves or have been described as new sovereignists. And they basically believe that trends in international law and trends in international organizations are basically subordinating U.S.—they’re basically—they’re supranational, if you will. They are above. They are hierarchical, above the United States. PATRICK: He’s right about—no, he wasn’t right necessarily about the wisdom of Brexit. But he was right about the fact that in joining the European Union, the United Kingdom, just like other members of the European Union—actually gave up a significant amount of authority to the EU Human Rights Council, to the commission in Brussels, et cetera. And I think this has been the bogey man that a lot of people who look at international treaties and organizations the United States has signed up to, that’s the argument they make. Their nightmare is some Frankenstein’s monster where we end up in basically a global version of the European Union. And where we’ve lost our sacred sovereignty. The Constitution is now subordinate to other people. And U.S. popular sovereignty doesn’t matter anymore. What I’m saying is that we don’t have to worry about that. Let me give you a second, if I can, example of where we have voluntarily sacrificed some autonomy, or at least accepted some incursions for the sake of cooperative security. And this is something called the Container Security Initiative, which many people haven’t heard about. It’s a non-binding thing. It’s basically an ala carte, to use Richard’s phrase, coalitional effort to try to deal with international security. And so there are, like, 25 ports, maybe 30 ports—major ports around the world. And as a result of this Container Security Initiative, which tries to basically maintain the security of the shipping containers around the world. Now, only 4 percent, maybe, are inspected—physically inspected before they get to the United States. But you try to improve the odds by working with customs officials in other countries. PATRICK: That’s right. Exactly. Exactly. PATRICK: But it’s a sort of—I guess that what I’m saying is it’s a great example of how by just giving up a little it helps you get your—the reciprocal obligations of others. PATRICK: Right. In a sense, it’s not binding. I mean, that’s the thing—the only thing that was binding about the Paris climate accords is we had to come up with a plan of how we were going to reach some target. And that wasn’t going to be legally binding. It was going to be legally enforceable in the United States. It was basically a set of aspirations. And all Donald Trump needed to do was to say, you know, we’ve looked at the numbers, and we can’t get there. So we’re going to change what the target is, or we’re going to change how we’re going to get there. And that would have fully been compliant with the Paris climate accord. But because he was playing to his populist, nationalist base—which sees all these other projects as sort of globalist and elitist—he basically rejected it. And what was fascinating about the Rose Garden speech is he rejected this explicitly on sovereignty grounds. There are about three paragraphs of the Rose Garden speech where he says it’s—you know, this is to protect the sovereignty of the United States, even though it was purely voluntary. HAASS: OK, so given that, what’s going on here? (Laughter.) Then what is this really a conversation about? HAASS: Since there’s nothing about the Paris agreement that was—no ceiling was set for us, we set them ourselves. And if tomorrow we want to change our ceilings, we can do it. So it’s hard to argue that we’re being compelled to do anything, what is this really a conversation about? What am I missing? PATRICK: I think it’s—I think this conversation is largely about domestic politics in the United States. And I think it’s a conversation about mistrust and dissatisfaction with globalization on a lot of different levels. I think partly it’s a battle for the soul of the Republican Party. But not just the Republican Party, Democratic Party obviously—you know, especially when it comes to trade issues. There’s a whole chapter that I have here called globalization—you know, the United States and globalization, “Stop the World I Want to Get Off.” And it starts out with Elizabeth Warren, backed by a tickled Bernie Sanders who’s about to declare his candidacy for Presidency, basically saying: The investor-state dispute settlement mechanism of the Trans-Pacific Partnership, TPP, is totally unacceptable. And eventually, of course, Hillary Clinton disavows TPP. PATRICK: Sorry. Yeah, that’s a technical word, yes. That’s right. And so I think—I do think a lot of it is domestic. And, you know, in the—you know, I could come up with a number of different reasons for why this is happening. Partly it’s a—partly it’s the tradition of popular sovereignty the United States has had for a long time and has always lurked in the background. HAASS: Well, let’s go back to that, because you mentioned the Democratic one seems linked to globalization—the Bernie Sanders, Elizabeth Warren. HAASS: But Republican embrace of sovereignty and rejection of organizations and the like that they saw as threats to sovereignty long predated serious globalization. I mean, if you think some of the League of Nations conversations, some of the U.N. So is—I mean, is that about Second Amendment? What is that about? What is—is it about something real, something imagined? What explains the fact that you had to write a book like this? Again, what’s going on here? Deconstruct it. PATRICK: Yeah, OK. This is—this is imbued throughout American history. And it has been a huge current percolating. I mean, I spent a lot of time talking about the founders. It’s fascinating reading, by the way. Educational, but fascinating reading. But it actually began, though, with a vignette in 1919, which is of a debate that was, at the time, considered by some reporters—this is the most anticipated debate since Lincoln and Douglas, right? And in March of 1919, in the Boston Symphony Hall. And it’s between Senator Henry Cabot-Lodge, who’s the chair of the Senator Foreign Relations Committee from Massachusetts, and A. Lawrence Lowell, who’s the president of Harvard University. So he’s got these two Boston brahmans, but they’re sort of going after each other, but in a very civilized way. Both very reasonable people. And what they are basically trying to debate is whether or not taking responsibility for world order to, in a sense, embracing the globalism that it would take another generation for the United States to do in the wake of Pearl Harbor, is that consistent with the U.S. Constitution? Is it consistent with U.S. freedom of action and the—and non-entangling alliances, no permanent alliances that our founders talked about? And is it—you know, there’s even concern—I read the transcript, and I was fascinating by it, because it’s really—a lot of it is about can we maintain our national identity as a people if we actually embrace this form of international cooperation? He even talks about—they even—every A. Lawrence Lowell was saying that we can’t have—we can’t open our borders to a flood of Chinese and Hindu migrant labor, which has some echoes from sort of more recent things. HAASS: But that suggests, listening to you, is that a lot of this is as much about identity and symbols as it is about anything with measurable policy consequences. PATRICK: I think that’s absolutely true. I think that—I do believe that there are—at least when it comes to issues of constitutional authority, which is one of the dimensions of sovereignty that I talk about. I think that those are largely symbolic. And they are about issues of identity. They are about—you know, for instance, I have a chapter on the border wall and border security and migration. And a lot of that is really symbolic politics, because of the things—one of the things about being sovereign, as Donald Trump has said, is a nation without borders is not a nation, right? And when you went down and talked to Enrique Pena Nieto and he said, you know, we all agreed that every country has a right to build its borders and control its borders, a sovereign right. And what—and I think in a lot of language that he uses and appeals to that notion is, you know, we are—we are close to historic levels of immigration, both illegal and regular immigration—legal immigration. And at different times when this has come up, the sovereignty debate has actually spiked. And it’s no surprise that in Trump’s campaign probably the biggest applause line that he got—I’m not saying in endorse it—was basically about closing down the American border. And a lot of it had to do with this sense of demographic challenges to existing social and racial status hierarchies, frankly, and what kind of a country—but, also, reasonable questions about assimilation too. I’m not going to be Pollyannaish about it. HAASS: Twenty-one references to sovereignty. So your subtitle is about reconciling America with the world. It seems to me a bigger challenge might be reconciling, you know, American and—well, reconciling the world to Americans, because what the president seemed to basically be doing was rejecting a lot of forms of engagement. Indeed, American first, but that somehow the world out there is implicitly or explicitly a threat to sovereignty, the fact that he had to assert it 21 times. So what is—what do you see as going on? And what’s the challenge? I mean, if you were to spend a few minutes with the president trying to talk this issue, what point would you make? PATRICK: How to organize yourselves, exactly. And yet then later on, in the second half of the speech, he really pivoted to be a little bit more of a neocon, and in terms of talking about regimes that were not behaving themselves, well, not simply because they were a threat to their neighbors, but because they were oppressing their own people. So it was a little bit of a muddled speech, pretty clearly written by committee. I guess I would say to him—which is, I guess, normal, probably, for these things. PATRICK: Always a good thing to do with your boss, exactly. You see, though, I was able to work for him a second time. (Laughter.) But it was—it basically—that sovereignty is necessary, but not sufficient, is a criterion for international cooperation, or for international order, right? I mean, it’s such a baseline. And one of the problems, if I can just, you know, channel you for a second here, is that—is that what has happened over the last several decades is a growing recognition that sovereignty cannot be a blank check. And actually, Richard is one of—Richard is at least largely responsible for me having written this book, because back in, say, 2002—I was—late 2002, when I was wet behind the ears at the policy planning staff he said, yeah, you know, after Afghanistan, and they were taken over by, you know, terrorists, and we’re looking also to what do we—what do we do with countries that are pursuing weapons of mass destruction in ways that they shouldn’t, he said: We need to think about sovereignty anew. And we need to think about contingent sovereignty. When do countries forfeit their sovereignty? I want you to sit down and at least begin drafting a speech for me. And it was called, “Sovereignty: Existing Rights of Evolving Obligations,” which he delivered at Georgetown University, I think, in early 2003. And what was fascinating about that was it started to say—started to realize, OK, look, after the atrocities that had happened in Rwanda and in Kosovo, et cetera, we need to have—and there were other folks, obviously, working in this field too—but we need to have new standards about what are the obligations of sovereign governments. And we also have to have new standards for people who harbor terrorists or are pursuing weapons of mass destruction. And so that was, in a sense, the—but I went through, I believe it was, 12 drafts of the speech, which I reference in my acknowledgements. (Laughter.) And when the 12th draft had proved acceptable, then I was able to move onto other things. (Laughter.) But, yeah, it took me—12th time was the charm. So that’s why—actually, I started getting fascinating when I was doing this on the basis of looking at sovereignty. And then I went for several years to do—to work on sovereignty and weak and failing states. But I kept coming back to this question of how does the United States actually think about these things? And sort the near image. HAASS: Last question: Can you imagine a politician who needs to get voted into office somehow selling the American people on your ideas? Or is what you’re saying just never going to fly because you can’t somehow explain it to people in ways that will attract? PATRICK: Right, exactly. Right, exactly. Because it just exploded immediately because, you know, of course, the president at the time could easily say, I don’t understand what Senator Kerry means, that there would have be some sort of global test to protect the American people. That just seems ridiculous to me. Right? But there are ways of doing things. HAASS: But just—let me interrupt, though. But isn’t a problem on that that it might also set certain regulations for our behavior, that might set certain people’s teeth on edge? PATRICK: Possibly, although I think that, you know, the argument has always been—that I’ve always had that it’s better if you’re in the room. And as the most—the United States almost uniformly—if it does not have the pen, it has the ear of the person that has the pen in some of these international negotiations. And at the end of the day, if we decide that we don’t want to sign up for something or just can’t stomach it, like—and this is a good example—is the International Criminal Court. I used to be initially sort of a fan of the ICC. I am a fan of the ICC’s aims, but I am less of a fan of the United States joining the ICC, simply because it doesn’t have the safeguards against an independent prosecutor who conceivably be politicized. And it’s not under the control of the Security Council. I would be much happier if it were. HAASS: Because we’d have a veto, if that were the case. PATRICK: Because we’d have a veto of that, exactly. So I think there are ways where you can organize institutions. And I try to get into this in this book as well. There are ways you can try to organize institutions so that they are more likely to be responsive to your interests and to your preferences. HAASS: OK. I’m going to open it up. Important subject. Intellectually quite nuanced and subtle. But also intellectually and politically loaded. So with that, Fred, do you want to? Just raise your hand and say who you are and keep your questions brief and I’ll do my best to recognize you. HAASS: What the Brits would call the camel’s nose under the tent. PATRICK: Nose under the tent. Yeah, and it’s—you know, it’s frequently made. In fact, in his Rose Garden speech abrogating or pulling us out of the Paris agreement, that’s precisely what the president said. He said, although it is true that this treaty is nonbinding, as we have known from experience—or we have learned from experience, these nonbinding commitments tend to take on a more forceful life of their own, et cetera. You know, I don’t think so. I think that we are extremely good at—particularly when it comes to treaties, because we—you know, as you know, because you probably were involved in, you know, drafting a number of them when you were working in the Senate. You know, we are very good at overloading—at loading, maybe overloading, treaties with reservations, understandings, declarations, provisos, et cetera, that some of our partners say basically mean that the treaty doesn’t really hold a lot of water. I think that, you know, there’s just so much alarmism. One example of alarmism was—which I also reference in one of the vignettes, was when, you know, wheelchair-bound Robert Dole is in the well of the U.S. Senate, right? And they’re debating the conventions of the rights of the persons with disabilities. And you have Senator Orrin Hatch, a very respectable man, but getting up and saying: If we ratify this treaty, it will allow the United Nations to have a say in virtually every aspect of American life. And you just sort of shake your head and think: On what planet could that possibly be true? Particularly given that it was drafted and the fact that it was—specifically the reservations were specifically included that it would not override any proviso of state law, and that it wouldn’t be justiciable in the United States. So it’s a very—and it was based on the Americans with Disabilities Act. But it testifies, I think, to the sort of knee-jerk know-nothingism of some of the opponents. Q: You mentioned the—Lucky Komisar, a journalist. You mentioned the investor-state—the act that allows international corporations to sue countries if, for example—the investor-state dispute mechanism—sue countries if, for example, they pass an environmental regulation, labor protection legislation, that would result in this international corporation losing money. Do you think that’s a just complaint? And I want to say, to me, I think it is a violation of sovereignty to say that it is more important for corporations to make more and more money than to protect people from being poisoned by chemicals or anything else the corporations are doing. Isn’t this a relevant issue? And you raised this. PATRICK: Yeah, yeah. No, Lucy—right? Yeah, I very much—I actually—I found that an objectionable provision to the TPP. And I talked with my colleague Ted Alden as well, who’s made sort of similar points, that, you know, those things should probably—it seemed like a pretty blanket right of foreign corporations, and there could have been thousands of them, to bringing complaint against the U.S. government and seeking relief on the basis of—of, excuse me—going to an international tribunal, and there being no recourse to any form of judicial process in the United States. So I found it objectionable. I have to say, I don’t know enough details about the specifics of it or how even really to modify it. But I do think that some of those concerns were warranted—to Bernie Sanders and Elizabeth Warren and then ultimately, one assumes, Hillary Clinton as well found objectionable. And the other thing is that much of that treaty was done—much of that treaty was negotiated, as many treaties are, in secret. But one of the difficulties was that there was a heavy, heavy involvement of private sector in the planning and drafting of it, which is no big surprise. But the question is, is there heavy involvement of, for instance, other interests that should have been involved in those negotiations? Q: Thank you very much. I can’t wait to read the book. My name is Lee Cullum. I’m a journalist from Dallas. I have to tell you, I read the news from Catalonia with horror, afraid the right wing in Texas will decide to secede too. (Laughter.) You may know that our current secretary of energy, when he was governor, thought that was an acceptable idea. But I’d like to go back to 1919, to Lodge versus Lowell. Who won the night then, could you tell from study? And who, in your opinion, was the more persuasive? PATRICK: Great question. I think that my—that my assessment in the book is that it was largely a draw, but that Lodge ended up raising enough qualms and putting enough momentum behind the notion that there should be reservations—which, he of course, eventually came up with, with his 14 reservations to it, you know, as the echo of Wilson’s 14 points. I think that—I think the case—as is often the case, I think Lodge was probably more eloquent in many ways. I guess what I mean, in this debate—in the sovereignty debate, you know how they say in “Paradise Lost” that the devil gets all the best lines. (Laughter.) There’s an element to which those who defend American sovereignty, because they’re able, in a sense, to wrap themselves in the flag pretty easily, have the more effective applause lines. So it’s incumbent on those who believe otherwise to come up with their own good lines too. HAASS: Mr. Laurenti, you have to introduce yourself. Q: (Laughs.) Not even within these halls. If you could explore with us, please, the—(laughter)—yeah, Jeff Laurenti; I said it twice—whether sovereignty really is an issue of the rights of the strong to be able to change their mind, to wreak their will. When North Korea renounces the Non-Proliferation Treaty, which, presumably, in a world of sovereign states it would have the right—sovereign right to do, there is justifiably a good deal of international pressure brought on it to penalize it for that course. When the United States discovered having once wanted a(n) arms embargo in Bosnia that, no, it didn’t want an arms embargo anymore, it was stuck because the Security Council had adopted one. And the Bush administration in 2003 was shocked to find, after having conquered Iraq, that it couldn’t sell the oil without having to get Security Council approval. So in all these ways, for the strong sovereignty seems to be a limitation. And this is what presumably grates on nationalist members of Congress and of the public. Is this a debate that you also see in the next rising power, China? Does the sovereignty question also ring true there? PATRICK: Yeah. I mean, I think that’s what’s distinctive about my book—and I do look at a number of other powers. The comparative aspect is not huge, but it’s present. And so I look at China, Russia, India. I think that—and the distinction I make is I think there are several aspects of American historical political culture, American exceptionalism, the devotion to popular sovereignty and what that means for international organizations that are big, and also the separation of powers, I should have mentioned, which obviously restrains our ability to actually make a credible international commitment. With respect to—but certainly with respect to China, absolutely. Not simply the sort of—the natural inclination of any great power or emerging great power to increase its influence over its periphery, but then also the historical experiences both of the Middle Kingdom, that has a suzerain state or a tributary state system historically around it, and then, of course, the reversion of that, which is the humiliation of, you know, 100 years—a 150 years at the hands of the Western powers. HAASS: But wouldn’t China in some ways actually agree with Mr. Trump? China didn’t much like the ruling about the South China Sea through a U.N. tribunal. So China basically—I don’t know how to say “sovereignty” in Mandarin, but they sure did. (Laughter.) And they basically however you say, “buzz off” in Mandarin, that was what they said. So isn’t this, to some extent, everybody essentially embraces sovereignty when it suits them, and they reject it when—you know? PATRICK: Yeah. I mean, and that’s—and I think—two points there. One, absolutely that—I mean, from a realist case, not a big surprise that countries would be attached to sovereignty and to try, and that the bigger that they are, the more unilateral and bilateral options that they have the more attached they would be to sovereignty. And it’s also the case that the bigger they are the more they can be hypocrites about sovereignty. And that’s why Steve Krasner wrote a great book about sovereignty called, “Sovereignty: Organized Hypocrisy,” because—you know, the difficulty is, of course, you got to be hypocritical enough, but you still—what is it—it’s the—what, hypocrisy is the obeisance that vice plays to virtue, right? And so you can’t—you got to at least have some virtue in there still. You can’t attack it so hard that you create awful precedents. HAASS: Let me get first the young lady behind you. She’s had her hand up longer than you have. Q: Sasha Zolley at McKinsey. I just want to ask, so what, right? So if you think that sovereignty tradeoffs will continue to be necessary in the future, how do you—what note do you sing to the folks who don’t want to make them? How do you connect with the people who do, you know, elect Trump and Hatch, and how do you relate to them and convince them that it is worthwhile? HAASS: Good question. How do you? PATRICK: Yeah. I think—well, part of it may end up being the sort of demonstration project of relative success or failure of those policies going forward. I mean, if you think about, there are obviously some famous examples where, you know, sovereignty is protected, but at enormous cost, like, you know, the Hoot Smawly—or Smawly Hoot—am I getting that right? PATRICK: Smoot-Hawley tariffs in 1930, 1931. And where the United States goes its own way in a highly protectionist way, and the damage is quite extraordinary. You know, or the America first movement, and the United States not really paying much attention to the global balance of power or its responsibilities. And therefore, you get a catastrophe. Hopefully, you don’t necessarily need to go down that direction. I think that, you know, partly communicating the degree to which we are already pregnant in terms of being—I’m sorry, I’m making any announcements here—(laughter)—but how we have—we have—in a sense, we are already speaking in prose, to change the metaphor there, where we are very much integrated into a global system of rules that are of our own making, that the vast majority of them are actually not particularly problematic on a day-to-day basis, and that—and just to reinforce that we have very little ability through our own means—and that is acting unilaterally or bilaterally in the case of trade—to actually fulfill—reach our actual objectives. Now, that can seem really abstract, so you’d have to break it down to the particular case. The other thing—I mean, one thing that I do talk about in the book, and building, again, on some of the work that Richard’s done in the past, which is—you know, the question today is not really should we go multilateral or should we go unilateral. It’s what form of multilateralism should we take? And so I try to make the case that you can actually, at very little cost—no cost to your sovereign authority, and at less cost to your sovereign autonomy, your freedom of action in other words, you can often get the same sovereign influence by using flexible frameworks of international cooperation. And so I try to say that what we need to try to do is hit the sweet spot between our reliance on formal international institutions—which is still needed even though they’re hide-bound and they’re frustrating—and then select groups of the likeminded, or capable, or interested. Q: Nancy Yao Maasbach, Museum of Chinese in America. I believe, in your comments, you sort of allude to the current immigration policy. There’s a whiff of 19th century nativist excess, with legislation like the Chinese Exclusion Act and other types of legislation like that. I suppose—you also mention the word “assimilation” earlier in your comment. You didn’t finish that thought. I wonder if there might be a squeal to this book, which would be called, “The Sovereignty War: Reconciling America with America,” because I’m wondering how much we really understand how that immigration policy in the 19th century affects an affected our policy today, and how we have really succumbed to assimilating rather than leveraging the gifts of a very multinational state. PATRICK: That’s very interesting. The chapter on—it’s called, you know, “Good Fences Make Good Neighbors,” but basically it looks at border security, migration, and American sovereignty. And what comes out in that chapter is what I call the societal dimensions in American sovereignty, because the notion of popular sovereignty presupposes—that is, rule by the people—presupposes sort of an identifiable people that is actually going to be exercising that self-rule and delegating it through their—at least temporarily, to their political leaders. 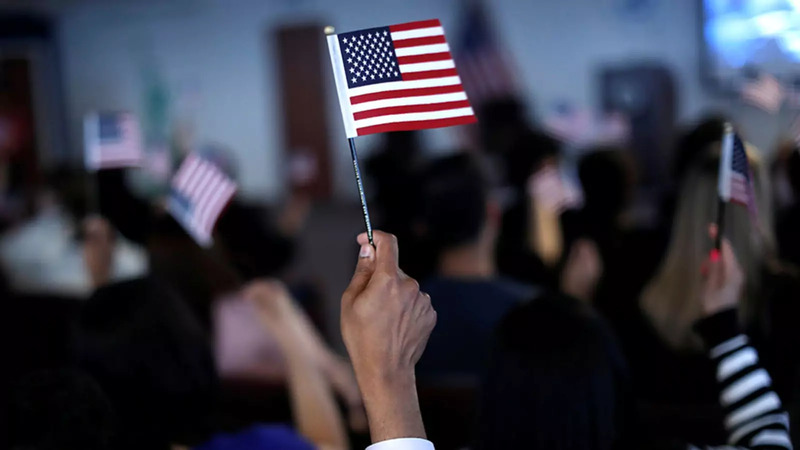 The difficulty—I mean, in the ideal of the United States, which we never totally lived up to, we are, you know, this individualistic country in which it doesn’t matter where you come from, as long as you commit to U.S. political ideals that are enshrined in the Constitution. The dirty underbelly, of course, in the United States, I mean, from slavery onwards, has been that we have had huge waves of nativism. And you mentioned the Chinese Exclusion Act. And I go through—in that chapter, I go through the waves in which that has occurred. And then, you know, immigration levels fall, and it becomes less of an issue, et cetera. But I think that—I mean, the more recent immigrant—one of the reasons why the immigration issue has been so fierce since the mid-1980s, really, and mostly related to Latin American immigration, particularly from Mexico and Central America, has been that there has been lip service by politicians that they were going to get the border under control, et cetera, et cetera. And they never—they never did. And at the same time, the former escape valves, if you will, that happened from 1942 to 1965, with the Bracero program, which allowed sort of a circular flow of labor from the United States to Mexico and Central America, that broke—that broke down. So what happened instead is you still had the economic incentives for migrants to come into the country, but you didn’t have them going away. So people were increasingly sneaking over and not—and just staying in the shadows. And so I think that we have to get more honest about how one—I do—I argue we have to get more honest about one begins to assimilate, which still making use—I mean, assimilate is maybe a loaded word—but while still making use of the incredibly diverse talents of our immigrant population. But we also have to recognize the economic incentives that have created this situation, and that just building a wall or doing this or that are not going to make those go away. But my colleague—again, my very smart colleague, Ted Alden, has written a lot on that.